This card is compleate BS. the only benefit is the prority pass, whis is another lie since you can only use it twice a year! Pass on this one; Get the amex platinum instead, you have a host of benefits for the same price! And so, assuming I could afford to pay $495 a year for a credit card, why would I? I own Amex platinum and Visa Black, since I don’t qualify for Amex Black($250,000.00/year minimum spending, 3k annual fee). They both have their benefits, but if I need a concierge for anything I always find myself going to Amex instead. If you are wanting to spend $500/year for a card, I’d go with Amex platinum. I have an american express centurion card and I have recently ordered this card. I will keep this posted on which one I like most. I am assuming that I will prefer the amex since they have been so helpful in the past. Great, look forward to hearing what you find the differences to be. Most of it right now seems to lie on the Concierge. Cheap knock off of Amex Centurion, for middle class who pretend to be rich. Uhhhh…anyone who carries any type of black card or platinium card(amex or visa) is a preteder in my eyes trying to be something their not . That type of snob appeal went out last September and anyone that values their worth (whether financial or otherwise) on the basis of the color of some piece of plastic they carry in their pocket is likely to be a person who grey up in some swampy backwater town wishing they could travel. I think cashiers being impressed by a card went out a long time ago, and here’s a tip if you really want to impress the person handling your card. Be nice to them. If you’re an ahole, a diamond honed into a credit card isn’t going to help. I have a Amex platnium skymiles card and pay I think about $200/yr and do so strickly for the miles. I try to pay everything that I can with it, pay it off each month, and usually end up getting at least 4 round trip tickets/yr with my miles, and a complimentary companion ticket (buy one get one free) each year as well. I think it’s got a lot of the other stuff with it as well, but I don’t use it, so I don’t know. I’ve always been very impressed with AmEx service as well. I do run across a place every now and then that want accept it though. Anybody Apply Wondering what the critera is to get this card credit score? Net worth? Yearly Income?. Maybe a step down from the Amex Black Card but sure would be nice to have a card that has a limited auidence like the Amex Black. Its not what these cards give you its who has them. Its all about Flash these days. I just received mine in the mail…not overly impressed. The card doesn’t appear to be carbon graphite as where the #’s are punched I can see white plastic. Presentation sucked as well, my PLAT AE came in nicer packaging LOL. I’m positive that this card will not come close to matching AmEx Centurion, but it seems as though they’re marketing it well enough to entice some qualified spenders, but doubt any of them would prefer it over the Centurion. For the ignorant folks who keep BSing about how the Centurion card is better: kindly hush up. 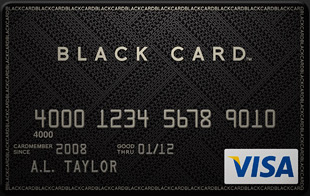 The Black Card is a competitor to AMEX’s Platinum Card, to which it has nearly identical benefits. This card will be the perfect solution for the millions of consumers that make a point to steer clear of American Experss for their numerous retail fees and the fact that VISA/MasterCard cards are accepted almost everywhere, where AMEX is still rarely taken outside the largest businesses. @Mark and others: AMEX Platinum has a LOT more features than just 24-hour concierge and twice-a-year lounge access. For your $495 you can get the AMEX Platinum AND a Visa/MC Platinum to cover you in case AE isn’t accepted somewhere. This Visa Black Card is like a Pontiac Fiero made to look like a Ferrari. I’ll stay with my AmEx Platinum. I too have an AMEX Platinum Card, and initial comparison of the new VISA Black Card to my AMEX Platinum card is somewhat disappointing, especially considering the extra $45 annual fee. However, the Black Card, in my opinion, DOES feel and look different than a typical credit card. You also receive luxury gifts throughout the year, which AMEX Platinum does not offer. With that said, I believe it’s entirely possible that Visa Black will roll out additional features and benefits as the months roll on, especially considering all of the justified negative press it’s receiving. The bottom line is that I’m willing to give it a chance to see where this might take me. i have had the Centurion Card for about 5 years now and find it very useful. the concierge and travel services are tremendous. I hope this card will rival the AMEX card, but based on their prelim. requirements, am very skeptical. We’ll see and I will keep you all in the loop. Amex Centurion card – 2 for 1 international airline program, 24 hour concierge, 24 hour full service travel agency (who also book your awardtravel with your membership rewards), complimentary access to Delta, Continental, Northwest and American Airlines lounges when traveling the that airline, Priority Pass, upgraded memberships with Continental, Delta, USAirways and Virgin Atlantic. Free membership to Avis, Hertz and National. 24 hour Global assistance, Fine Hotels and Resorts Program – great upgrading and perks at thousands of hotels worldwide. There’s so much more….Use the card once on the 2 for 1 and you get your fee back. I have had the VISA Black Card for 2 months now – not too impressed, especially at $500 annually. I also have the AMEX Platinum and have always enjoyed using it. I would gladly use a Centurion AMEX if offered, however I would never meet the spending requirements. Therefore, I will have to settle for the Black Card with a generous $50k credit line. No “free” gifts as of yet…. I got my amex bc when it rolled out the first year. It took them time to get all of their programs up and rolling. It is a great card to have for exclusive opportunities but expensive to use. I could have gotten better pricing using my standard visa when traveling. Merchants have to charge you more for the higher amex fees. I look forward to seeing how visa improves their benefits program. It isn’t a wanna be card it is just a different program. The annual fees between the amex bc and visa bc prove that. I do enjoy that visa is excepted a lot more places all over the world!! You are all deceived. Credit cards are a social scam weather black, red, yellow, whatever. Furthermore, nobody every became a millionaire with points. I mean really! And stop buying things you cannot afford to pay with cash or a debit card. Stop participating in the idiocy. Loose the ego. The point system is actually a really intelligent investment. And credit cards are not always for people who can not afford to pay in cash. Some people pay in full every month because they want another way to establish good credit…. it’s called financial sense. You can’t place hotel reservation with cash and some hotels won’t take debit cards!!! Credit cards a great way to itemize your travel expenses. Points are a great perk for those who travel a lot and pay off the card monthly. Evidently you must not know how to use credit properly. You can’t place hotel reservation with cash and some hotels won’t take debit cards!!! Credit cards are a great way to itemize your travel expenses. Points are a great perk for those who travel a lot and pay off the card monthly. Evidently you must not know how to use credit properly. Has anyone had a lot of luck getting sign ups? I was thinking about getting a card myself but I am not sure if the $495 annual fee would be worth it for me or not? Amex gold, platinum and centurion are not credit cards – they are charge cards. Get your facts straight before going off on a rant. I “love” these cards. Cash Advances = Prime + 15.99 % = Currently 19.99%. If I could afford these cards why on earth would I use them for cash advances? I don’t get it. I use credit and debt cards all the time, but I don’t get how one can be better than the other. It’s hard to understand even what the purpose of credit cards is. The merchant pays a fee and buyer gets to wait a month to pay. It’s hard to get worked up either for or against that. Since some credit cards pay 1% back and provide insurances and misc features I never use, it’s hard to imagine using a card that I actually have to pay for. Maybe I’ll understand it if I meet someone who is into expensive credit cards. I happened upon this article and comments of “man this card or that card is really good/bad,” and it’s baffling. How good or bad could something like a payment card be? I have the centurian card from Amex. This black card does not compare. The weight of the centurian says something – YOU ARE A BOSS! Just to follow up on debt_is_dumb’s comments– I agree with your general point– don’t build up debt and don’t spend money you don’t have, that will never make you wealthy. However, I do vigorously disagree with debt_is_dumb’s comments about using a debit card. Why do I want to use a debit card which provides me less consumer protection that a credit card and which provides an account number thieves could use to plunder my account? If I have a fraud problem with my credit line, I report it to the credit card company, end of story. If I have a fraud problem with my debit card, I don’t know about it until my account has already been cleaned out. I would never ever use a debit card aside from ATM withdrawals. Similarly, if I am going to buy something, why pay cash when I can charge it to my AMEX Centurion? I like the fact AMEX forces me to pay the bill in full at the end of month. Yet I end up at the end of a year with enough points from my card purchases to obtain two business class tickets to Europe every year. That’s certainly more advantageous that if I had been walking around with that much cash. “omg rich people”. you just wish you were us… try and say you don’t. I just got the invitation for the Visa Black Card. I was really tempted to apply for it, but with all the reviews on here I think I will stick with my AMEX card. This card in a nutshell is a plastic card that has minimal services compared to even my Amex Costco card lol… If the card was made out of carbon and had somewhat similar travel benefits such as being allowed in the first class lounges like AMEX I would apply with no regrets. Points are evil. They make you think you are getting something, which actually costs %10,000 their perceived value. In order to get a $100 voucher, I have to spend $10,000. This drives up the cost to a merchant, who ends up charging customers more for the credit card fees. This cost gets passed on to the consumer, so actually I pay $10,000 + probably another $200 in credit card fees, for a net loss of $100. Points also have a way of stimulating spending, so a credit card holder will shell out a lot more than he normally would. Brilliant idea, but the consumer pays enormously. AMX blue cash is reported under your credit report as “Credit” not charge. Maybe the black card-Gold-Plat cards are reported as Charge. If your available credit is reported more than likely it will show as “credit”. I DO NOT SEE WHY I WOULD SUBJECT MYSELF TO A $495.00 ANNUAL FEE AND A 1% REBATE.CURRENTLY I PRIMARILY USE THE COSTCO AMEX CARD THAT GIVES ME A 1% PLUS REBATE WITH NO ANNUAL FEE. THE SECOND IS A FIDELITY VISA CARD WHICH PAYS 1.5% WITH NO ANNUAL FEE.IF YOU WANT GRAPHITE BUY A PENCIL. i want to meet whoever can afford this idiotic card..You can’t even email them, they must be LEGIT… And their spokespeople are slutty GIRLS NEXT DOOR and the ELLEN DEGERERES. Why don’t they just make satan a spokesperson too.